Dive site the Tugboat is a small unnamed wreck known for its variety, colors and close encounters. Seen in all the brochures and dive magazine is the little wreck aptly named Tugboat. This is a good spot for diving and snorkeling. 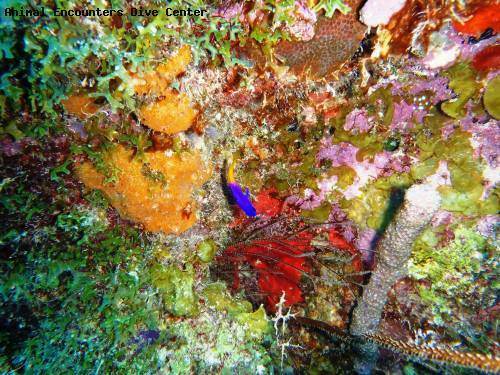 The dive is along a vertical wall, where morays of all colors look at you. Large amount of common sea fans and devil's whip decorate the wall. Larger hawksbill turtles are commonly seen here. Your safety stop will not be boring at all. Not hanging on a line, but swimming with large parrotfish and yellow tail snappers. Do not be afraid of the encounter, they tend to come close. Be sure to bring along some bread or other leftover food to feed the fish. They are used to being fed here by tourists snorkeling with Bounty Adventures and other boats, and will enthusiastically eat anything you drop in the water.